Yesterday I once again stumbled upon whitespace trimming of STL strings: a check was required if the given user input is empty. Where "empty" also means some user-given string containing only spaces. After one hour of unproductive searching for something as simple as a space trimming function, I decided to put the resulting code here for future reference. The following code snippet contains two versions of the function: in-place trimming and string-copy trimming. I prefer the copy-trimming function because they allow a more functional programming style. The functions only trim spaces, but can be modified by replacing each &apos; &apos; with something like " \n\r\t". Released an updated version 0.8 of the STX B+ Tree C++ Template Classes package. The update fixes a few segmentation faults with empty trees without root node. This new release includes the demonstration program wxBTreeDemo. 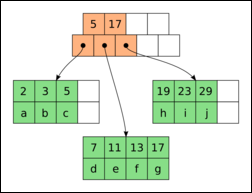 This program draws illustrations of the B+ trees constructed by the STX B+ Tree template classes. It allows the user to selected different types of B+ tree instantiations: integer or string keys and different slot numbers. 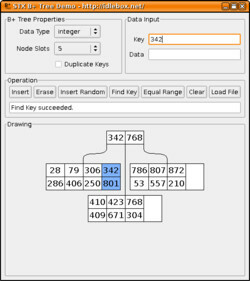 The user may insert and erase key/data pairs from the tree and run different search operations. The demo program uses the cross-platform wxWidgets toolkit and can be compiled on Linux, Windows and MacOSX. The source code package including the wxBTreeDemo source is available for download from this webpage. As before, the only slightly changed main B+ tree implementation can be found in doxygen stx/btree.h or with plain text comments stx/btree.h. Writing test cases is a good way to prevent and detect problems or bugs in source code. They improve understanding of the difficult parts by requiring deeper thought into how to test of those areas. By rerunning the same test sequences one can assure that the code still produces the same results even after making significant changes. cppunit provides a C++ test framework which is sort of over-bloated. However reduced to a set of reusable template files the framework gets quite handy. To measure how much of the code is tested, gcov provides a way to determine which lines are executed during a test suite run. Note that this simple line-is-touched metric is only one aspect of how well a piece of code is tested. However gcov&apos;s results are printed in text mode and it cannot merge the results from multiple coverage files, so multi-file test suites cannot be measured as a whole. Yesterday I finally found a good open-source Linux tool to get correct coverage results: lcov. It was designed to measure coverage in the Linux kernel, but works very well on user-space programs as well. lcov builds on gcov&apos;s data files and generates HTML report files. It even highlights the untested source code lines. I uploaded the test coverage results of the STX B+ Tree test suite. It shows 89.2% coverage of the main, most difficult header file implementing the insert and erase algorithms. 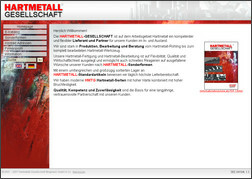 Finished redesigning the web site and e-catalog of the Hartmetall-Gesellschaft. This is actually the fifth version of the homepage. It is now based on Template::Toolkit technology with the old PostgreSQL database back-end. The style was adapted to todays modern web designs. The zlib library can be found on virtually every computer. 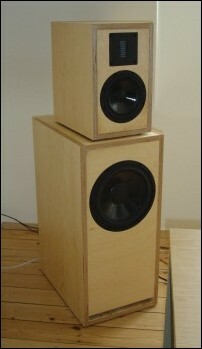 It is THE general-purpose lossless patent-free compression library. This small C++ code snippet features a pair of functions which use this ubiquitous library to compress ordinary STL strings. There are many uses for this code snippet, like compressing string data stored in a database or binary data transfered over a network. Keep in mind that the compressed string data is binary, so the string&apos;s c_str() representation must be avoided. To compile the following small program use "gcc testzlib.cc -o testzlib -lz" where testzlib.cc is the code. oss << "Exception during zlib decompression: (" << ret << ") "
std::cerr << "Inflated data: "
std::cerr << "Deflated data: "
The Boost library is a collection of very useful C++ (template) libraries. However it&apos;s documentation is very complex and using the library straight-forward usually results in g++ scrolling endless pages of template instantiation errors. This code snippet shows by example how to use the Boost.Regex library. It compiles and executes regular expressions on strings. Some test I ran showed that it is not as fast as pcre, however Boost.Regex it is easier and more elegant to use in C++ programs. The program must be linked with -lboost_regex. // First example: char* c-style input strings use boost::cmatch results. // Second example: STL strings use boost::smatch results. // Third example: Temporary regex object and no capture results needed. // matches substrings just like perl. 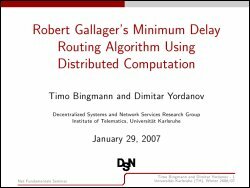 Following up on the technical report, today Dimitar and myself gave a 70min presentation on Robert Gallager&apos;s Minimum Delay Routing Algorithm Using Distributed Computation. It finished my work for the NetFundamentals seminar, which was organized by Decentralized Systems and Network Services Research Group at the Institute of Telematics. The seminar was very profound and extensively dug into the mathematics of six fundamental networking papers. Besides that it was great fun and opened some new horizons. Our presentation can be downloaded as PDF (553 KB), with two slides per page or even with four per page. Furthermore our listeners were given an equation sheet (139 KB) to aid them in following the many formulas.